Are Americans as well-off as they used to be? The answer affects everything from product markets and housing sales to social tranquility and presidential (and local) elections. 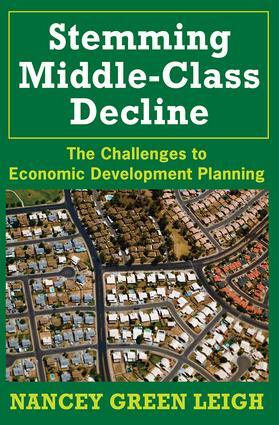 This volume examines what is happening to the American middle class. In a detailed and comprehensive analysis, Nancey Green Leigh tracks changes in the pattern of income distribution over a twenty-year period. While earnings have increased, there is a widening gap between what middle-level earnings can purchase and the cost of a middle standard of living.Due to the fact that this decline has not been experienced equally in all regions, separate analyses are reported for urban and rural locations, major census regions, and the largest states. To identify which workers have been most affected, Leigh compares earning trends by race, gender, educational level, industry of employment, part- or full-time status, and fringe benefit recipiency. Rejecting short-term and demographic explanations, Leigh links the decline of the middle class to economic change and industrial restructuring.Leigh concludes her work by examining planning and policy prescriptions to improve the prospects of members - and aspiring members - of the middle economic class. She documents the decreasing ability of middle-level earners to purchase a middle standard of living and attributes the decline in part to failures in planning. Failures of planning, she observes, have contributed to the growing divergence between middle-level earnings and the middle standard of living. Stemming Middle-Class Decline provides comprehensive data and trends on workers, communities, regions, and the nation that all policymakers and government officials should read and examine with care. Are Americans as Well-Off as We Used to Be? What Is Happening to Middle-Level Earners?